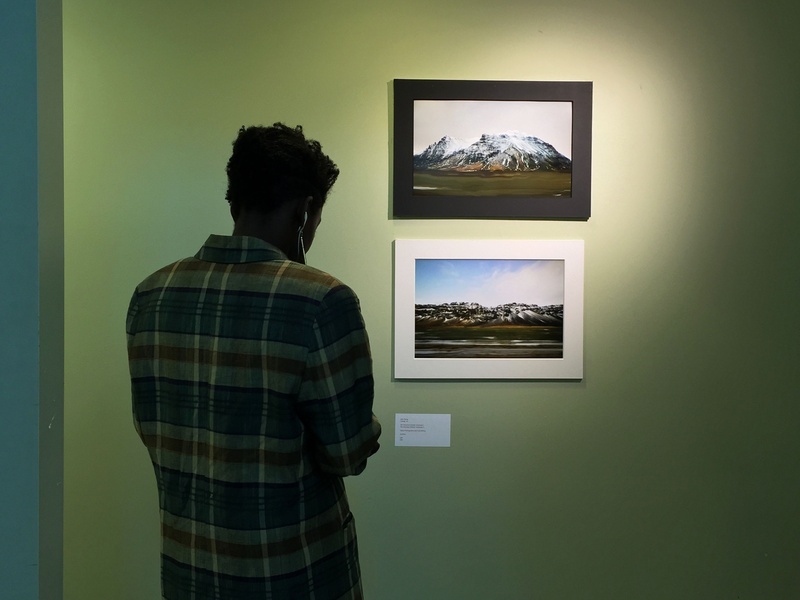 Abena Duker 18'-19' examines photographs at the Harvard Student Art Show, which ran from Friday through Sunday at 29 Garden Street. The eighth annual Harvard Student Art Show took place at Arts @ 29 Garden this weekend, organized for the first time as an independent event rather than as a part of ARTS FIRST weekend. In its new home on 29 Garden Street, the exhibition spanned five rooms and two floors, with 70 pieces selected from around 230 submissions. Thurm also ascribed this change to a difficult history of competition for limited space on campus. 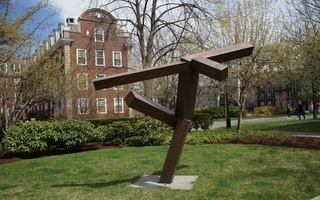 In previous years, the Harvard Student Art Show has taken place above the Cambridge Trust Company and the basement of CGIS Knafel. Both spaces were not ideal for showing art, especially when complications for hanging or displaying the art arose from facility restrictions. “Our goal this year was to get a space we could really own as ours,” Thurm says. “We also had total freedom to use the space as we liked,” Elson adds. At 29 Garden Street, photographs and paintings lined the walls as attendants weaved through sculpture after sculpture, snacking on cheese and wine. The stories behind the pieces from 38 visual artists ranged from political to personal to scientific. “We really wanted to get a sense of the arts across campus… giving Harvard students a sample about what they’re thinking about, what they’re making,” Elson says. One piece titled “Family” by George T. Liu ’19 considered the relationship between his identity as a queer Asian and idealized concepts of a perfect family. Another painting called “24 Trump Pinatas,” by Paul D. Fiegenschue of the Graduate School of Design, depicted 24 papier-mâché renditions of presidential candidate Donald Trump on a single canvas. Javier A. Masis of the Graduate School of Arts and Sciences put up seven pictures of coronal slices of a rat’s brain next to a actual rat’s brain immortalized in resin. The Harvard Student Art Show’s eclectic collection invites the audience to explore a wide variety of art of different mediums and stories from artists affiliated with different schools within the University. 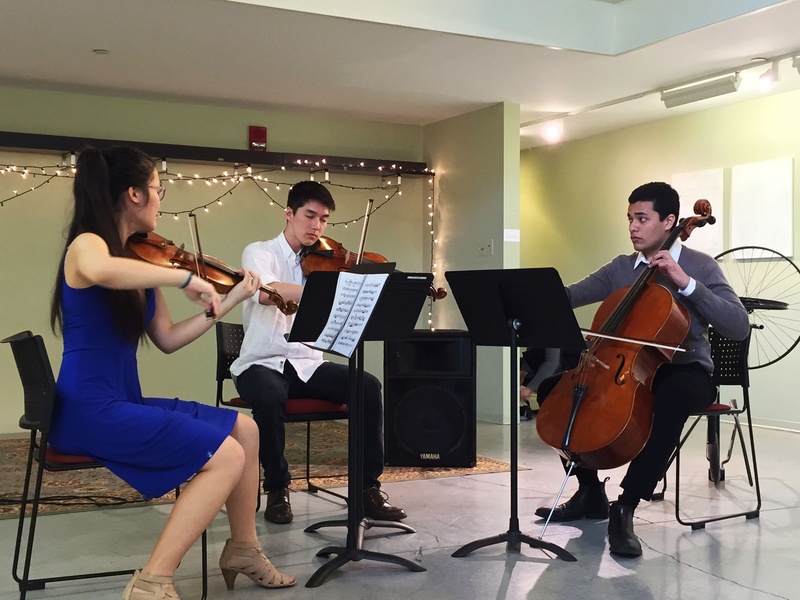 Violist Jackson Whang '18, cellist Kartik Papatla '18, and violinist Cecilia Yao '18 perform at the Harvard Student Art Show on Saturday afternoon. The Harvard Student Art Show also expanded beyond the visual arts this year, including performances for the first time in many years. “Our goal is to have a lively space,” Thurm says. 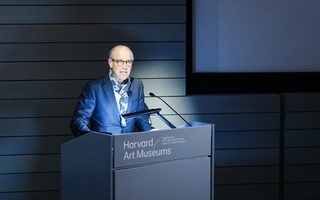 “We’re having all the performances in the gallery itself.” Performances included shows by groups such as the Harvard Ballet Company, the Harvard Lowkeys, and the Lighthouse Keepers, and by individuals singing with the acoustic guitar, or playing yangqin, a Chinese hammered dulcimer. Nick J. Stager ’16, a performance artist, had a space to himself as he wrote continuously, ensconced behind glass, on a typewriter for the entirety of the art show. Artists, as usual, were also given the option of selling their work. “Selling your work is a part of being an artist. It’s some level of being able to sustain your next piece and continue to create and fund your passion,” Thurm says. “We want to be able to provide that opportunity.” Prices could be as low as $5 or as high as $2,500. —Staff writer Grace Z. Li can be reached at grace.li@thecrimson.com.